So happy to have another online friend with me today: Lisa and I crossed paths when I happened across her blog–most likely via Twitter. 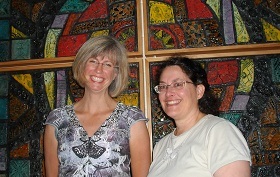 Please welcome her and Shellie, co-authors of their first contracted release! 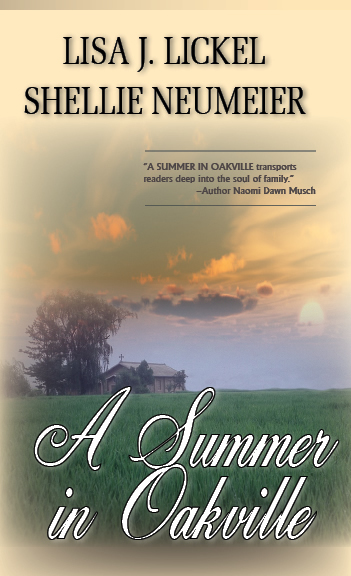 One Magical Summer in Oakville, Wisconsin, Love Finds its Way through Four Entwined Lives. Both Shellie and I are committed to helping other authors – Shellie with the Young Adult and upcoming youth writers, and me with, ahem, adults who are getting into or restarting a writing journey. To that end, Shellie is part of NextGen Writers, which just held their first conference. For my part, I was one of those writers who got a contract way before I was ready. I knew absolutely nothing about marketing or much about how to use the Internet. Around the years of my first two contracts in 2007 and both books releasing in 2009, I took some time away from writing to learn how to be a businesswoman. I will always be learning, but one thing hit home: build relationships, get to know people—even in cyberspace. I started a couple of group blogs for two purposes: to gather writers for networking, resources, and fun, and as a place where readers could come and learn more about us and our work. In many ways, Lisa, I feel as you do about getting that contract before I was ready. (Have a feeling many authors do. :)) I’m so grateful for the pay-it-forward attitude of the writing world, and the generosity of writers in sharing their knowledge. How else would we all get by? Tell us about your wonderful site! Reflections In Hindsight is one of those places I described above. It’s also an incubator site for writers who are just learning how to blog and build their fanbase. We’re evolving, but the schedule right now is that on Mondays I feature some aspect of Marketing, on Tuesdays we feature authors and books, Wednesdays you peek into a writer’s life, Thursdays one of our authors, Ben, chats about what’s going on in his world of learning to be a writer and get published; Fridays Elaine, who writes historical novels, shares research, and Sundays we try to have book reviews. I invite guests and encourage networking in all of our areas. This way, our authors can also learn to interview and write effective reviews and we all encourage each other. You can find out more about Shellie and me, our books and networks (including Facebook pages) and our scheduled tours for our latest books on our web sites. A Summer in Oakville Facebook page. So glad to have you here, Lisa! Best wishes with your release and in all your future endeavors. And thanks to those of you who dropped in! Please feel free to ask any questions you have. I’m so impressed with the process two authors writing a book–I have enough trouble on my own, lol!